The Madras White Buffalo wrestling program traveled to Cottage Grove for the Cottage Grove Invitational Friday and Saturday and had three place in the top five. The Buffs finished in 11th place out of 27 teams with 107 points. Glide (212), Phoenix (190), and Douglas (188) were the top placers at the tournament. White Buffalo 152-pound wrestler Victor Torres (20-5) won his first two matches by fall in under three minutes. In the semifinals match, Torres pinned Mike Walker, of Phoenix, in 5:20 to reach the finals. Torres faced undefeated (20-0) wrestler Titus Rice, of Pleasant Hill, in his final match of the tournament. Rice was able to beat Torres in a 6-3 decision and Torres placed second for the White Buffalos. Junior Kody Zemke (29-10) won his first two matches by fall in under 40 seconds. Zemke lost his next two matches by fall against Daniel Underwood (27-6), of La Pine, and Noah Knight, of Douglas. The 220-pound wrestler, Zemke was able to pin Zach Virgil, of Glide, in 3:57, placing fifth for Madras. David Sumner (280) won his first two matches by fall, both in under a minute, to reach the quarterfinals. Sumner was pinned by Zach Welker, of Glide, but wasn't discouraged, winning two consolation matches by fall. In the consolation semifinals, Sumner lost to Mikey Sierra (16-3), of Henley, by fall, but would win his last match of the tournament, pinning Cole Breight, of Douglas, in 1:05. Sumner finished the tournament in fifth place. Madras faced both Sisters and The Dalles in the Sisters 4-Way Tournament Jan. 22. The Buffs barely lost their dual against Sisters, but notched a close victory over The Dalles. Madras won half of its matches against Sisters — all by forfeit. Sisters won two matches by forfeit and was able to win the 285, 120, 145, and 195-pounds matches, beating the Buffalos 33-30. The next dual, against The Dalles started at the 195-pound weight class. Osmar Piza was pinned in 1:08. Zemke (220) tied the dual at 6-6 by pinning Miguel Torres in 1:06, and then David Sumner (285) won by forfeit. 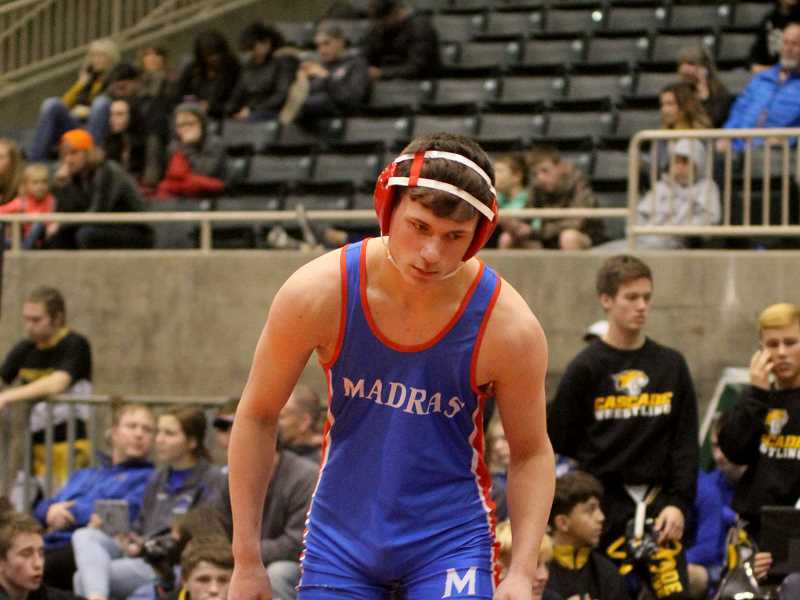 The 106- and 113-pound matches were won by The Dalles due to forfeit and the 120-pound match was won by Madras due to forfeit, tying the match at 18-18. The Dalles won the 132-pound match by forfeit and Elijah McCourtney (138) lost a 9-6 decision to Andrew Richman. Conner Comingore (145) pinned Ben Nelson in 3:38 and at 152-pounds, Victor Torres pinned Austin Greene in 4:24, giving Madras a 30-27 advantage over the Riverhawks. Leander Smith (160) was pinned in 42 seconds by Steven Preston and The Dalles took a 33-30 lead over the White Buffalos with one match left. Madras freshman Reece White was up for the task, pinning Taylor Morehouse in 1:21, sealing the 36-33 victory for the Buffalos. Madras has a hosts the Madras Invite this Saturday in the Buffalo Dome, starting at 9:30 a.m. They also host the District tournament Feb. 8-9.